This painting was used for the 1996 USA Olympic Handball Team. In dramatic fashion, The Anatomy of Team Handball depicts the action and intensity of the lesser known sport of team handball. Property of Kadir Nelson. All rights reserved. 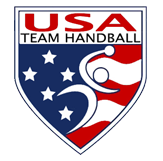 Carolina Team Handball Club (CTHC) is one of the premier team handball programs in the USA. CTHC was founded in 1989 to expose members of the University of North Carolina community to the competition, health, and athletic benefits available from the great sport of Olympic team handball. With a healthy dose of hard work and humble beginnings, and through many successes, CTHC continues the tradition today. CTHC welcomes everyone from beginners to seasoned veterans. You must be a student, staff or faculty member at UNC with a valid UNC OneCard to play. Contact us or lace up your boots and come to a practice.